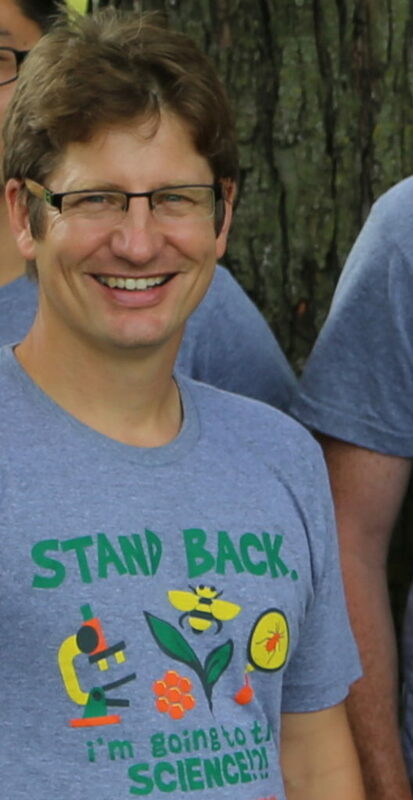 Dr. Matt O’Neal is an Associate Professor of Entomology at Iowa State University. He received his B.S. in Biology and M.S. in Entomology from the University of Illinois. Matt served as a Peace Corps Volunteer between those two degrees. After his masters he went on to receive his PhD in Entomology from Michigan State University. Next, Matt conducted postdoctoral research at Michigan State before joining the Faculty at the Iowa State where he is today. Matt’s honors and awards include the Team Achievement Award for the Crop Advantage Series from Iowa State University Extension, the National Excellence In Multistate Research Award from the American Public Land-Grant Universities, and the Integrated Pest Management Team Award from the Entomological Foundation. He has also received various awards from the Entomological Society of America, the American Society of Agronomy, and the Board Certified Entomologists of Mid-America for his educational and outreach efforts. In addition, Matt is co-host of the Soybean Pest Podcast with his colleague Erin Hodgson. Matt is here with us today to tell us all about his journey through life and science. Matt has two daughters, and much of his free time is spent hanging out with his family or playing soccer in a nearby recreational league. Research in Matt’s lab focuses on pest management and insect ecology. Some of his current projects examine pest insects on soybeans and also conservation of pollinator insects, especially bees. For Matt, an early inspirational figure in his life was his grandfather who was a math teacher. As a kid, Matt was not particularly fond of insects, and he didn’t really have a strong inclination towards science until he connected with phenomenal mentors and advisors during his undergraduate and graduate training. His first research studies were in honey bees. Matt got a rush from beekeeping, and considered pursuing it as a career. However, during his time in the Peace Corps, his focus shifted from beekeeping to more applied entomology with crop pests. In the first summer of his PhD, Matt was excited start his first dissertation research project. He was successful in his Master’s projects, and was expecting the PhD work to go relatively smoothly. This experiment was a struggle. It just didn’t work. He was becoming more and more certain that the entire summer was going to be a waste. One day, he had a meltdown in the car on the way home from the field in front of his fiance because nothing was working. Finally, he was able to get the experiment right and got usable results, but it was definitely a challenge. A recently completed project by two of Matt’s PhD students investigated soybean resistance to aphids. A breeder combined several genetic traits to try to create soybean resistant to aphids. Matt’s lab field tested these resistant soybean strains and found they worked really well. In fact, the plants were so well-protected that pesticides were not needed. They conducted further research investigating resistance management plans and confirmed this solution could be sustainably used over time. This was a big success from a research perspective, but it was also great to guide two students through their PhDs and see them go on to get jobs in the field. About five years ago, Matt had an opportunity to travel to Yunnan province in China. He hosted a collaborator in his laboratory, and as part of their agreement, he traveled to China to observe the agricultural systems and learn about crop pests and pollinators there. Yunnan is fairly tropical, and the biodiversity was spectacular. It was also very diverse in terms of religion, culture, and ethnic makeup. He marveled at the beauty of the surroundings and the different farming techniques used on terraced rice paddies on the mountains. Scientists have a reputation for being introverted, but you can get even introverted researchers to really open up by asking them about their science and the things they are passionate about. Matt has worked with a lot of different people in his research, and asking questions is a great way to get people to talk. In fact, Matt actually talked himself into a Master’s program position without really giving much information about himself by simply chatting with a faculty member about research projects. For your research, keep in mind that it doesn’t exist until it is published. Also, try to practice reflective listening where you summarize what another person says to ensure you understand each other. This can be very valuable to strengthen relationships and collaborations. Matt oversees research related to the management of insect pests of annual crops, with a focus on soybeans. His overall goal is the development of pest management programs that are economically and environmentally sustainable. To achieve this goal, he explores the ecology of pests with their host-plant and natural enemies, often within a landscape context. This research has contributed to the management of soybean aphids in Iowa and throughout the Midwest US. More recently, his lab is exploring how conservation methods may improve the abundance and diversity of beneficial insects that contribute to aphid mortality and crop pollination. This later topic includes study of the pollinator community that resides within corn and soybean fields. Matt has published 47 scientific papers, reviews and book chapters on insect pest management and ecology. He teaches two classes within the department of Entomology and a course as a member of the Graduate Program in Sustainable Agriculture.